Francesco Celebrano and Paolo Persico, seventeen-sixties. 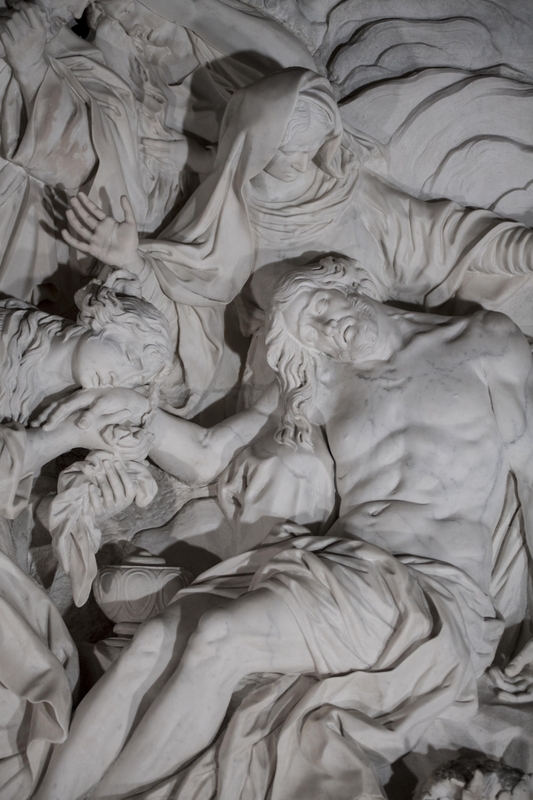 The high relief, or marble picture, of the Deposition was carved by Francesco Celebrano, but it had been entrusted to Queirolo (and Corradini had already made a clay model). 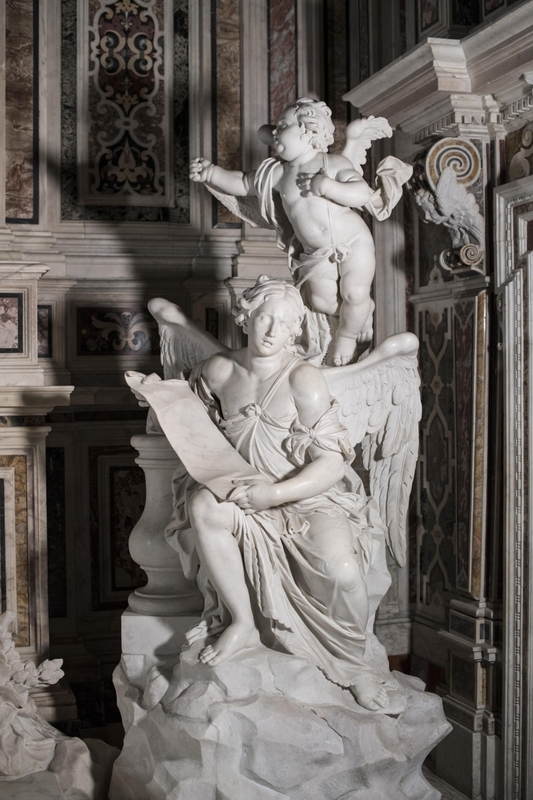 This work, considered by critics to be the best of Celebrano, is a unique exemplar in Naples of a high relief on a high altar, even if the technique can be found in the city in various other contexts. 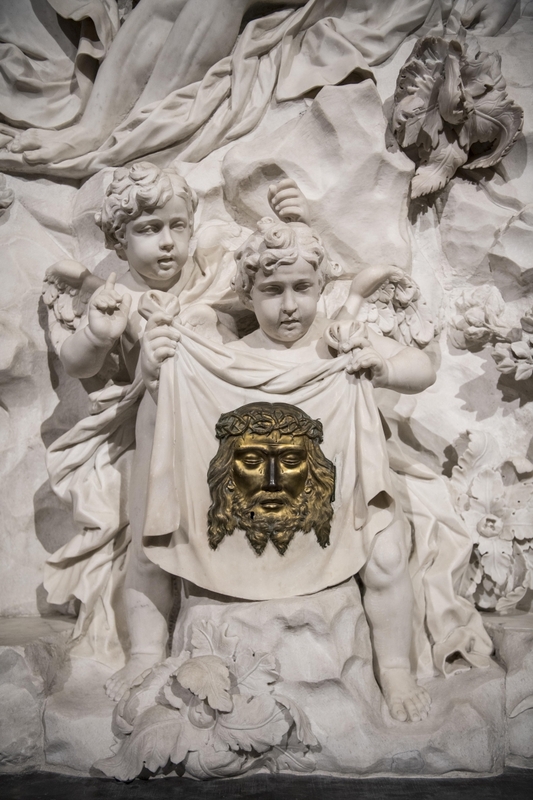 Celebrano shows his skill by combining late-baroque elements with the rich and fertile elements of the Depositions of the seventeenth century in the Neapolitan area and makes the scene remarkably complex, narratively dramatic, and almost constrained in the limited spaces, including the tabernacle inserted within a shroud supported by two putti and closed by the metal face of Christ. 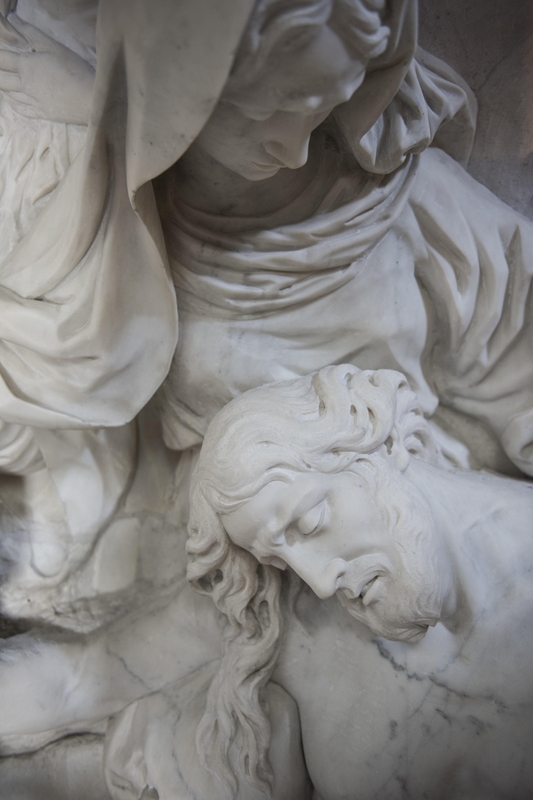 The torment of the body without life, the suffering of Mary and the Magdalene leap out from the composition. Below the altar table, inserted in a frame decorated with vegetation, a putto uncovers an empty tomb. 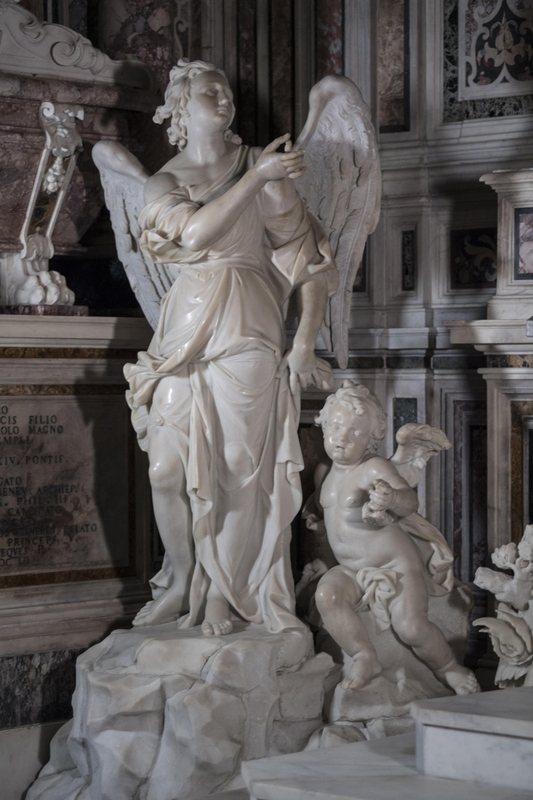 To the sides of the steps to the High Altar are two Angels by Paolo Persico, in typically baroque drapery, carved in a marble which seems to come alive. 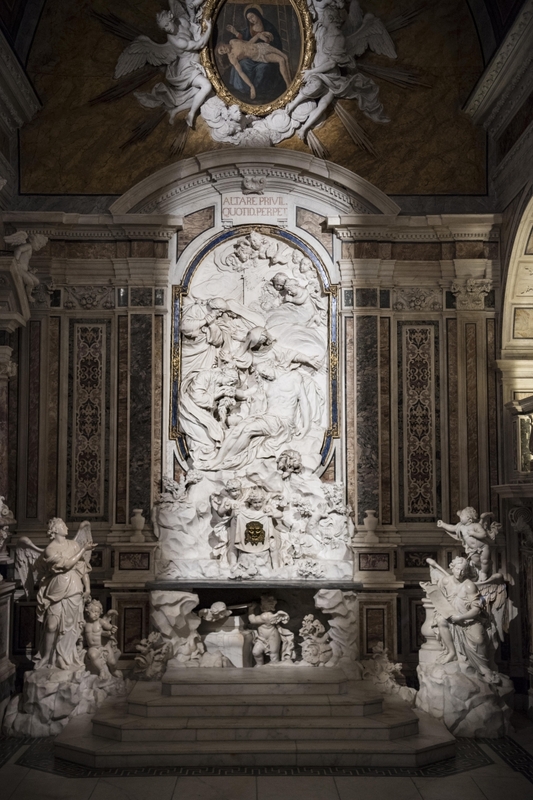 Above, framed in a starburst of stucco angels, also by Persico, is the painting of the Pietà, by an unknown Neapolitan artist in the late sixteenth century. 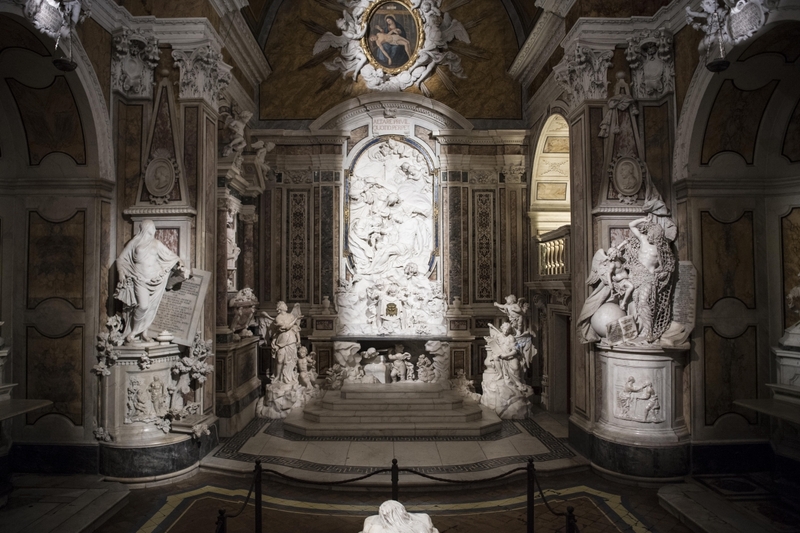 This picture, which before its new position chosen by Raimondo di Sangro was presumably where the Deposition is now, is associated with the legend of the origins of the Sansevero Chapel. On the right side of the sanctuary, lastly, there is an alcove leading to a small choir.